The number of tables/equipment is determined by several factors. You will need to know the number of guests attending the event. We have found that approximately 70% of the guests will be playing the games at any given time. Other activities, such as dancing, picture taking or karoyke will decrease the percentage of players accordingly. The square footage of your venue is also important. You want to make sure that the tables and players are not too crowded together. Let us make sure you have the space needed for all of your guests. We will be happy to meet with you for an onsite evaluation of the space you are using. 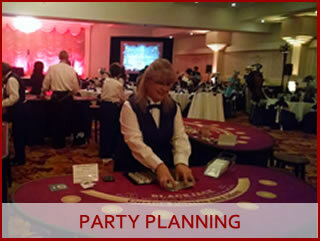 Our staff will help you design the placement of tables, games and slot machines. Blackjack, craps, roulette and Texas Hold’em are the most popular games with blackjack being the overwhelming favorite. For a party of 100, we would typically recommend 7 blackjack tables, 1 craps table, 1 roulette table and 1 Texas Hold’em table.